That day, the MTA system and all schools were closed. It was one of my favorite days in New York. Atypically, my family ate breakfast together that day, drinking hot chocolate and chatting. It was like a holiday, except no one knew it was coming. Snow stopped falling during the night, and the next morning, social life on the streets of Queens flourished once again. I finally had a chance to meet my neighbors while we were all clearing the snow. I had been living in this place for a few years now, and never before did I have a chance to talk to them, but now we were working together helping each other. Soon, the snow turned to slush. A day after, it melted completely. On the fourth day, life in NYC returned to normal. I grew up in Poland. For those who may wonder, Poland has four seasons: beautiful spring, hot summer, golden autumn, and winter, with the chance of snow from November till March. People never know when the first snow may come and how long it will lie. I remember winters when snowdrifts would build up over the months, and snow stood over from December to early April. Yet, a school was never canceled due to the snow. The only exception was when the class teacher would cancel advisory hour to go sledding on sacks filled with hay. Occasionally, the whole class would go for a sleigh ride that ended with a huge campfire in the woods. As a kid, I loved playing in the snow: I would find the biggest drifts to overcome, or build a snowman and borrow (steal) my dad’s hat to put atop my snowy friend. 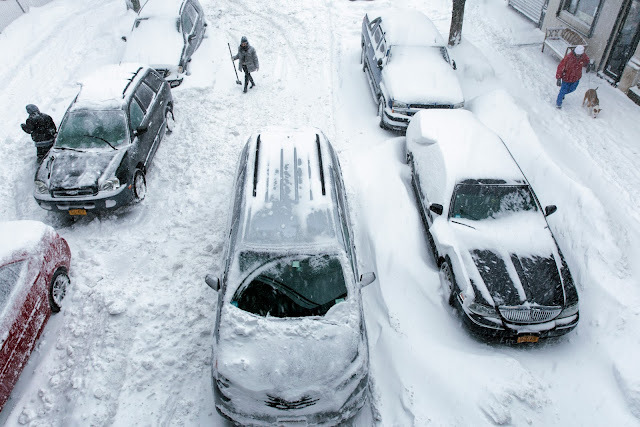 When driving on a street with high snowdrifts on both sides of the road, I would always imagine that I was driving through a mystical maze to a magical place, a wonderland from a fairytale. Winter is a magical time that brings people together. During the holidays people all around the world spend time with family, preparing traditional dishes and watching movies. While all of that is great, there is another way that you can spend quality time with friends and family. The best way to really appreciate a true beauty of winter is to go out and enjoy the snow and the ice. I would never expect myself to enjoy ice-fishing. It was my husband’s idea to pack up and drive five hours upstate New York to spend a weekend in the coldest part of the state. 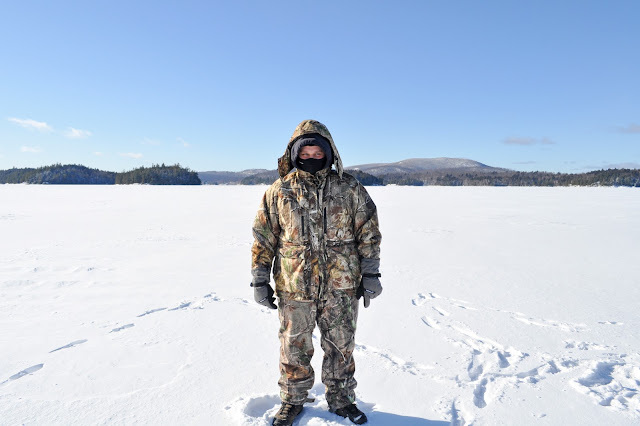 My brother fishes all year long, so he has a New York State fishing license and all of the necessary equipment, including good cold weather gear to stay warm. On the ice, it was so freezing that taking my gloves off was painful. The ice was so thick that making a fire in the middle of a lake wasn’t a problem. 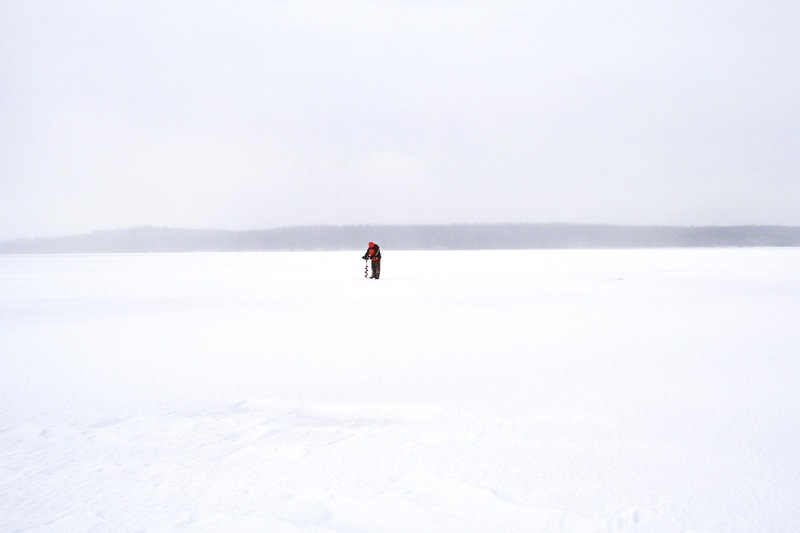 Surprisingly, there was something very peaceful about being out on a frozen lake. I am not a fishing pro, and I never really enjoyed fishing in the warmer months, but I loved being out on that cold ice. For me, it wasn’t about catching a fish. It was about the crisp winter air and beautiful, snowy landscape that seemed to clear and calm my mind. These surreal circumstances allowed me to simply be and nothing else seemed to matter. Being on a frozen lake requires an adequate wardrobe. You can buy professional winter gear, but if you are not planning on going on some other major winter trip and you are not a frequent ice-fisher, you can avoid spending this kind of money by simply layering up. The first layer should absorb moisture easily so you will stay dry if you sweat at all. Materials like Capilene or polypropylene are often chosen by professionals, due to their ability to wick moisture away. However, speaking from experience, cotton mixed with synthetic does just fine. The next layer should keep you warm. Fleece is an option, but nothing beats wool. If you don’t have a wool sweater in your wardrobe, substitute it with your favorite thick jumper. The final layer should protect you from the cold wind and snow. Down jackets and ski pants are nice because they are warm, light, and usually provide a wind breaking shell on the outside. High-quality fabrics like gore-tex are waterproof but also breathe. Whatever material you choose, make sure you have a hood for extra protection from the wind. Thirty percent of body heat is lost through the head, so don’t forget to protect your head and face. Make sure that your hat covers your ears well. Bring a face mask and neck warmer with you, and goggles, if you have them. If you don’t, make sure to layer your scarfs. Wear a smaller, cotton shawl or bandana underneath your jacket, and wrap yourself in a bigger scarf on the outside to protect your face from the wind. Sunglasses will provide eye protection. If I were to invest in one professional piece of winter wardrobe it would be gloves. Believe me, on ice you need to protect your hands well. It’s best to wear two pairs of gloves. Thin neoprene fishing glove will not limit your ability to bait the line or remove the catch. Mitten liners will keep your hands from freezing when you are not using your hands. You can find them in most winter sports and gear stores. If you plan on staying on the ice for hours you may need to invest in pack boots with special insulation. However, if your attitude toward ice-fishing is more laid-back like mine, your waterproof winter boots should do, as long you wear warm wool socks. My favorite brands of winter shoes are Timberland and Ecco. The Adirondack Region is located in the northern part of New York State and made up of twelve year-round destinations with mountains, valleys, and lakes. I particularly like this part of New York in the winter, since its frosty landscape reminds me of winter in the Northeast part of Poland—the place where I grew up. Lake Placid is a destination known for high peaks wilderness, Whiteface Mountain, and winter sports—Lake Placid hosted the Winter Olympics in 1932 and 1980. Tupper Lake, well-known for its picturesque hiking, pristine lakes, and friendly atmosphere is one of the best regions for the fishermen. If you don’t have fishing experience, I would not recommend ice fishing alone. It’s best to start with someone who has already done it and knows how to identify safe ice conditions. If you don’t know anyone, don’t worry. 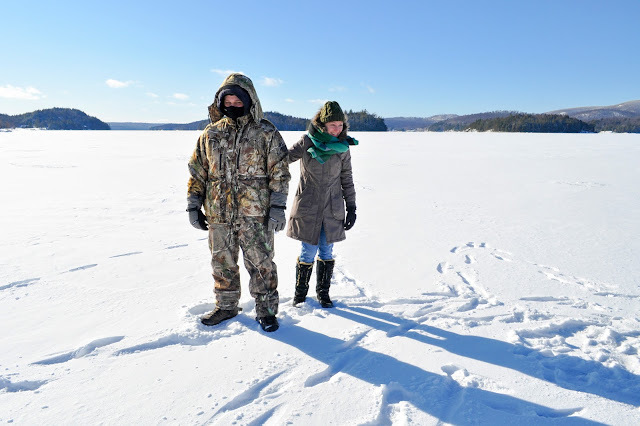 There are a lot of options in Tupper Lake to have fun on the ice or in the snow such as skiing, cross-country skiing, sledding, hiking, and much more. 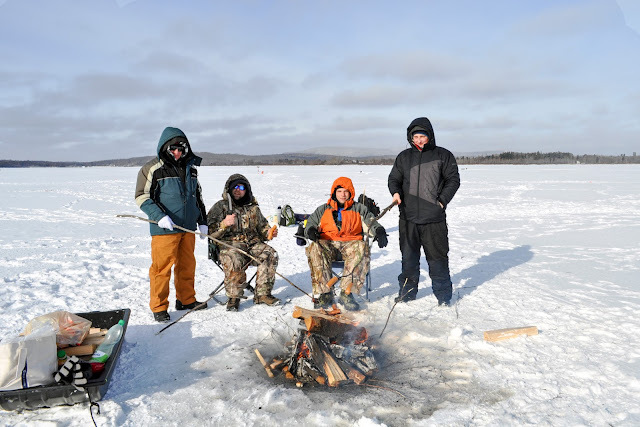 Check out Tupper Lake official website for more winter fun inspirations. 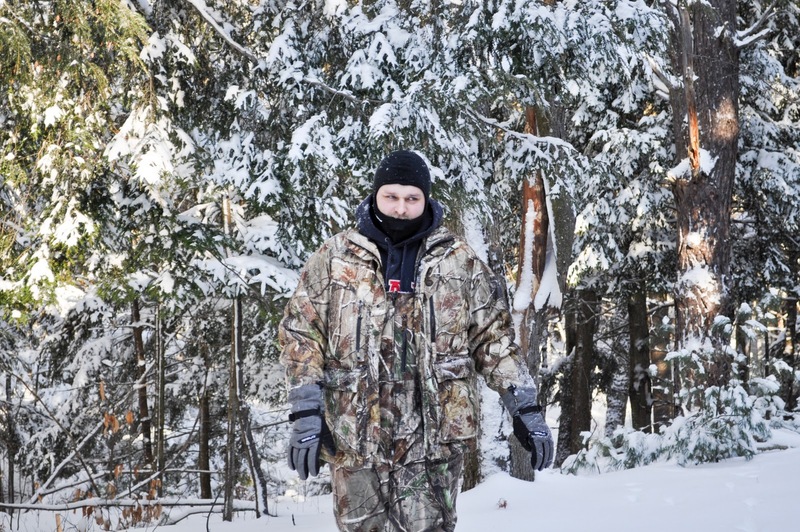 Bundle up, get outside and try a new way to spend winter weekend getaway. Amazing! Keep doing such great work.